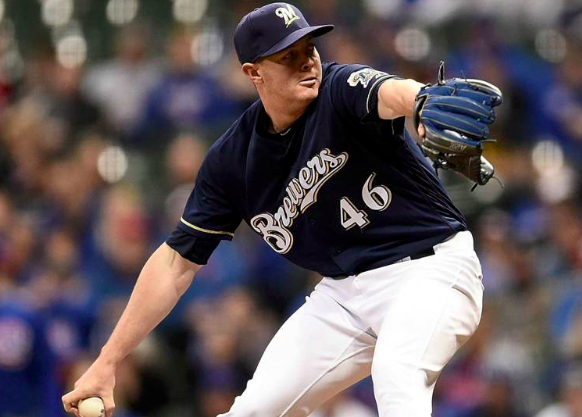 Just one game into the season, the Milwaukee Brewers already know they’ll be without closer Corey Knebel for all of 2019. Knebel told reporters on Friday that he will soon undergo Tommy John surgery. The procedure will keep him sidelined for the entire season. It’s an early blow for a Brewers team whose success in 2018 was in large part tied to their bullpen. Knebel was shut down a little over a week ago because of elbow pain. After getting the medical opinions of several specialists, Knebel weighed his options and ultimately decided to have the surgery rather than try to rehab the injury. Knebel previously suffered a partial tear of the UCL in his elbow back in 2014. He revealed on Friday that he’s had soreness in his elbow for around five years but that it “got a little worse” this spring. Knebel will now miss all of 2019 and potentially a chunk of the 2020 season as well. Meanwhile, the Brewers have suffered a significant loss in their bullpen. Knebel saved 39 games while posting a 1.78 ERA in 2017. He failed to match that performance last year and was eventually demoted to the minors. However, Knebel eventually returned to the majors and was dominant in September, helping the Brewers reach the postseason. He then allowed one run on two hits in 10 innings of work during the playoffs. A healthy Knebel would have undoubtedly been a huge part of the Milwaukee bullpen in 2019. To make matters worse, the Brewers have started the season without Jeremy Jeffress, another proven late-inning reliever. Jeffress is working his way back from arm weakness. Brewers manager Craig Counsell indicated this week that Jeffress is several weeks from returning. With he and Knebel out of the picture, Josh Hader is now serving as Milwaukee’s closer. Hader pitched two innings in Thursday’s season-opener to get the save, indicating Counsell doesn’t trust the depth the Brewers have in their bullpen right now. With Knebel out for good and Jeffress on the shelf indefinitely, it’s possible the Brewers will look outside the organization for help. Milwaukee has reportedly been in contact with free agent closer Craig Kimbrel. He would certainly be a difference maker in Milwaukee’s bullpen and form a great tandem with Hader. Of course, whether the Brewers can meet Kimbrel’s financial demands to sign him remains to be seen. Obviously, when Knebel was first shut down, the Brewers knew there was a chance he’d miss the entire season. However, they still didn’t have much time before the season to prepare for his absence. The team’s bullpen, which was a great strength last season, is looking a little thin at the moment. In what could be a tight and competitive NL Central, the loss of Knebel could end up being a massive setback for the Brewers in 2019.